Flourish! 2014 is a free student-led conference to promote the adoption and use of Open Source, Open Hardware, Open Culture, and more! Flourish! 2014 is proudly presented by the Linux Users Group and the Association for Computer Machinery at the University of Illinois at Chicago. Registration is NOW OPEN! Register before March 19, 2014 to reserve your free T-shirt. Flourish! 2014 will take place on April 5, 2014. Be one the lookout for more information on our website at flourishconf.com and on the ACM listserv. Got any questions? Feel free to talk to any of the ACM/LUG Officers about it and/or send a message to the listserv. For the most up-to-date event listing, please refer to our Calendar. Week Six! Good Luck on Midterms! With enough practice, you'll ace them for sure! Happy Valentine's Day from LUG/ACM/Chase. 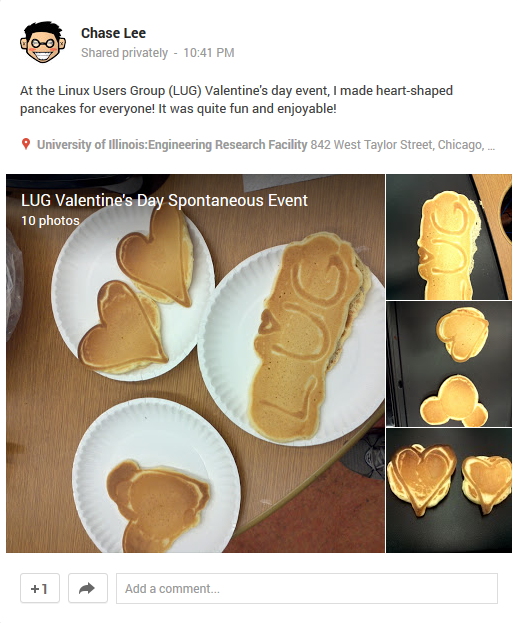 For those of you who came to the Valentine's Day Spontaneous Event, I hope you enjoyed the free pancakes! Keep an eye on our Calendar for the next Spontaneous Event presented by LUG! More Things Coming Soon™ Maybe? It's week five and midterms exams are quickly approaching! But don't let that get you down, Valentine's Day is also this week! "A Spontaneous event has appeared!" Can you believe that we are ALREADY a quarter way done with the semester already?!? and finally there will be free pizza and chances to talk one on one with members of their staff after the presentations. Bringing a resume is probably a good idea. The bus back to UIC would be leaving sometime around 7:30 or 7:45. Because kCura is providing us with transport we need to give them a head count of who is coming so they can sort out the buses. Therefore I need anyone who wants to come to fill out this form by 12:00pm Friday January 31. If you are not signed up you are likely not going to be able to come. This is also a reminder that the kCura Meeting Sign-Up deadline is on January 31, 2014. Please sign up via the form to let us know you will be coming with us. Most serices appear to have been restored since the network changes. The current main exception is that the ACM hosted mailing lists, acm-announce etc, are currently not working and user will be unable to send email using their account. The problem should be fixed soon and there will be another update when the mailing lists and email is fixed.